You may have heard of the term post-modern, relating to the era that some would say we are in that is after the modern era. Depending on who you ask, the modern era with its values, ideas, practices, and general way of doing things started somewhere between the 1600’s or as late as the twentieth century. The starting date is not important for this discussion per say but just to know that it has existed in our history. When it comes to postmodern, it is even more elusive. Some would debate if there has been a significant change in eras from a modern to a postmodern. Yes there have been changes in thought and how we identify our selves but I cannot significantly define if this is big enough change for people or not. What I can say that in this change of thinking which could be placed in the postmodern era, is that there has been a push away from what we call absolute truth. The idea of absolute truth, an idea/fact that is true no matter what or in what ever context. In passing you may have heard the question, “what is truth?”. Have you taken time to really think about this question? At times I have heard the question, start thinking about it and then get distracted. Other times I have taken a great deal of time to think about how truth affects my life. By the way I do believe in an absolute truth, and I believe that Jesus fits into the role of absolute truth. So in my life, as a pastor, but also as a husband, father, and friend, truth is at the heart of my life. Truth is important to me and I try to live out this truth. So it is troubling when I have heard the term multiple times this past weekend, the term post-truth. It hit me after reading some Facebook posts about theology which then started me thinking back about different news articles and a radio program I was listening to that talked about false news, especially in regards to the United States presidential election. In the news field, it is easier today to get and transmit “news” through social media by way of what is called citizen news writing. The ethics of news industry, which I have been unsure of in the last number of years in some cases do not need to be followed. I have heard arguments that now we are free from the over arching influences of the media providers when we have regular people sharing the news instead of people with an alterior motive in presenting the news the way that they do. Yes we all have biases no matter how hard we try to be unbiased, some of our biases come through in how we receive information and relay it to others. If you have had a longer conversation with me you may have heard that I think we are on the verge of a new dark age because we are becoming more and more reliant on retrieving information without knowing if it is true or not. We are learning less but have more information at our finger tips, but we are becoming less and less sure if the information that we have is true, fact, opinion, or total fiction. Even the idea of claiming truth is becoming passé and yet there is a subtle move to impose other’s truth on to me even when it is debatable whether their is any backing to that truth. Truth is being defined by the loud majority and when this is challenged they are defined as a new heretic, oppressive, bigoted, etc. I will admit that this argument can be used against the Christian church for upwards of 1500 years. It has caused harm to people and cultures but as people are reacting to this harm that has been caused we need to be careful that the reaction that goes against these historical facts don’t become the modern oppressors. The struggle that we need to really engage in is not whether or not there is truth, but how do we work together with those around us to live in truth and not be beaten down by truth or beat someone else down with truth. Truth exists. As a Christian I am continually learning how to love others while living with the truth that Jesus is and has given to us. If we try to say there is no truth, we create a paradox, but more importantly we harm ourselves but belittling our own existence by saying that we are each the highest level defining, essentially that we are our own gods. In doing this our hope is reliant on our own abilities, strength, hope, relationships, etc. What happens when we fail ourselves? What happens when we look so far into ourselves that we lose the important relationships that bring life and meaning? Post-truth is not a good thing, it is a very dark place that we could drown in. However, the truth of Jesus’ life, reaching out and helping the hurting, lonely, sick, even those who are dead we see that there is hope instead of nothingness. In Jesus’ death we see that God is willing to go to this great length to reestablish a relationship with us. The resurrection of Jesus shows us that the hope that the disciples had in Jesus was not unfounded and neither should our hope in Jesus. Jesus overcame even death, imagine what He can do in your life. You don’t need to be alone. Jesus is waiting to hear from you. He has already sent you the message. What will you do with His truth. Discipleship has been on my heart lately. I have been studying it from other people’s perspectives, taking a course on it, and trying to see how this idea that Jesus demonstrated, called people to and even told His disciples to continue and pass on to each of us and we are to continue to pass it on. But part of that is wrong, it is not simply passing it on. Jesus said in Matthew 28:19a “Therefore go and make disciples of all nations. . . ” Jesus told His disciples to be intentional about it and not to just pass it on but we are to make disciples. We can pass a baton, but that does not mean that the next person suddenly becomes as good of a runner as you. We can pass on information but that does not mean that we the person that we pass on the information to will have any idea what to do with the information. Jesus said to make disciples. The word make is a verb, an action word, that involves one person acting on or interacting with another person in this context. To make a disciple there has to be interaction between two or more people with one person guiding the learning and another person being willing to accept learning. In our case all should be learning something but I believe at least one person does need to be directing the majority of the learning. Jesus brought together many people but we remember only twelve disciples and we know that of those twelve disciples only three of them got the special time together. Most of us know all this, it is right there in the scriptures more specifically in the Gospels but why do we forget about it in our own lives? When did so many of us stop thinking that go out and make disciples of all nations stop including us? Going over what I have read I have struggle to see if I have truly been discipled. How many of us can remember an extended relationship with someone that was dedicated to refining us, making us accountable to one another and to Jesus, and helping us to live a life where Jesus is our center? I’m not talking about something where we were sequestered away in some remote place and got up at dawn and were praying and reading the scriptures all day, although that might sound nice. I am talking about the need to have someone that walks with us through life and meets with us for a few hours each week and helps us to grow in our faith, in our walk with Jesus, and helps us stay accountable. I see this happening in so many other areas of people’s lives but somehow this can get lost, yet this was one of the founding principles of Jesus’ church. I’m not saying that I am great at this. I struggle with it. I have lots to do like so many of you. But one thing that I am trying to do is take this time with my kids. Helping them to pray and read the scriptures and then helping them to apply them to the rest of their lives. I am still working on this and have not perfected it especially with those entering into the teenage years. I do have someone I am meeting with who is helping me along with this. But I realize there is so much more to it. It would be wonderful if we could all be in a discipling relationship, learning and then helping others to learn but not just from each other, learning to learn from Jesus. Can you imagine how the your community of believers would look now if we were to all be into a discipleship relationship and be committed to continue to disciple others. The worry would not be about not having enough people but that many lives are being changed. 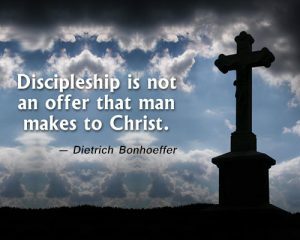 Remember discipleship is not just about passing on information, it is about allowing Jesus to be at work in your heart, mind, body, and soul. Discipleship is more about learning to live in Jesus and allowing Jesus to live in us and see how He changes our lives and invites us to help others’ lives to be changed and in so doing change our community with the love and grace of Jesus. If we stop at just ourselves we are disobeying Jesus. It is more than just Sunday School, or passive participation in worship or a small group it is about actively participating in a growing relationship with Jesus and others with us.